With shipping estimates for new iPad 2 orders having already slipped to 2-3 weeks just hours after they began, more potential customers may be heading out to their local stores to try to snare one of the popular tablet devices when they go on sale at 5:00 PM local time in the United States. 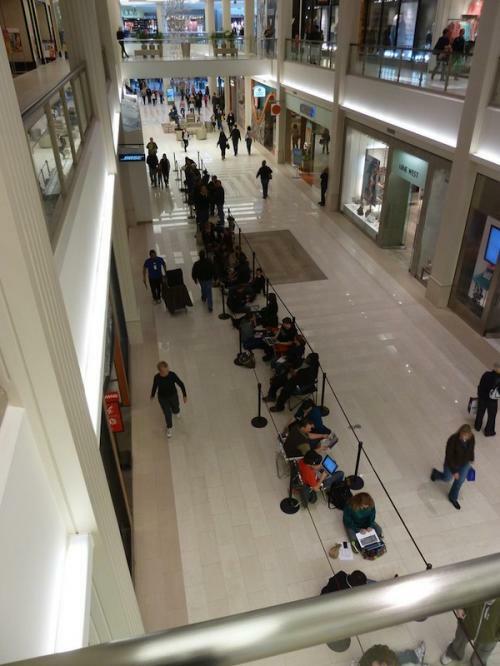 We're hearing of long lines at many Apple retail stores with a little over two hours to go until the iPad launches at locations in the Eastern Time Zone, although they haven't yet approached the magnitude seen for the iPhone 4 release last June. Lines are reportedly significantly shorter if not non-existent at many third-party retailers such as Best Buy, Target, AT&T, and Verizon, although we're also hearing that stocks may be very limited at these locations. As noted by Fortune, a woman who had been camped out first in line at Apple's flagship Fifth Avenue store in Manhattan since Wednesday afternoon this morning sold her spot for $900. 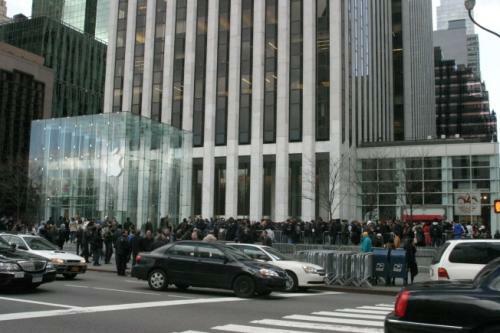 BGR also has a recent photo gallery from outside the Fifth Avenue store, where hundreds of customers have lined up.